He may be just eight years old, but he seems to have his goals sorted: to become either an IAS officer or a musician. Vedant Reddy is a warm little boy who enjoys meeting and talking to people and, if he could, listening to music all day. He also loves reading books and watching Harry Potter movies any number of times, so much so that he calls himself a “Potterhead”. He often narrates interesting stories with his family and composes some, too. No wonder his mom, Sumana Reddy, thinks he’s going to be a writer! Vedant goes to CHIREC School and loves solving math problems. His other interests include tennis and playing the drums. After returning from school, he goes on little “spy missions” and saves the day, along with his little brother and partner in crime, Viren Reddy. Also a waterbaby who enjoys swimming, he says that his most favourite thing to do is “watching movies and TV shows with family”. This eight-year-old has already stolen many hearts with her modelling skills as a child artiste. 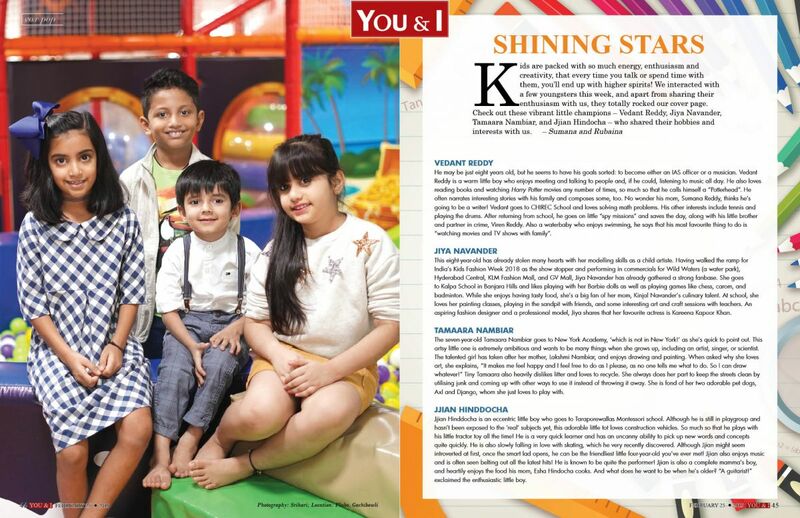 Having walked the ramp for India’s Kids Fashion Week 2018 as the show stopper and performing in commercials for Wild Waters (a water park), Hyderabad Central, KLM Fashion Mall, and GV Mall, Jiya Navander has already gathered a strong fanbase. She goes to Kalpa School in Banjara Hills and likes playing with her Barbie dolls as well as playing games like chess, carom, and badminton. While she enjoys having tasty food, she’s a big fan of her mom, Kinjal Navander’s culinary talent. At school, she loves her painting classes, playing in the sandpit with friends, and some interesting art and craft sessions with teachers. An aspiring fashion designer and a professional model, Jiya shares that her favourite actress is Kareena Kapoor Khan. The seven-year-old Tamaara Nambiar goes to New York Academy, ‘which is not in New York!’ as she’s quick to point out. This artsy little one is extremely ambitious and wants to be many things when she grows up, including an artist, singer, or scientist. The talented girl has taken after her mother, Lakshmi Nambiar, and enjoys drawing and painting. When asked why she loves art, she explains, “It makes me feel happy and I feel free to do as I please, as no one tells me what to do. So I can draw whatever!” Tiny Tamaara also heavily dislikes litter and loves to recycle. She always does her part to keep the streets clean by utilising junk and coming up with other ways to use it instead of throwing it away. She is fond of her two adorable pet dogs, Axl and Django, whom she just loves to play with. Jjian Hinddocha is an eccentric little boy who goes to Taraporewallas Montessori school. Although he is still in playgroup and hasn’t been exposed to the ‘real’ subjects yet, this adorable little tot loves construction vehicles. So much so that he plays with his little tractor toy all the time! He is a very quick learner and has an uncanny ability to pick up new words and concepts quite quickly. He is also slowly falling in love with skating, which he very recently discovered. Although Jjian might seem introverted at first, once the smart lad opens, he can be the friendliest little four-year-old you’ve ever met! Jjian also enjoys music and is often seen belting out all the latest hits! He is known to be quite the performer! Jjian is also a complete mamma’s boy, and heartily enjoys the food his mom, Esha Hindocha cooks. And what does he want to be when he’s older? “A guitarist!” exclaimed the enthusiastic little boy.